We love to travel because we want to learn the history of other countries and understand its people better. 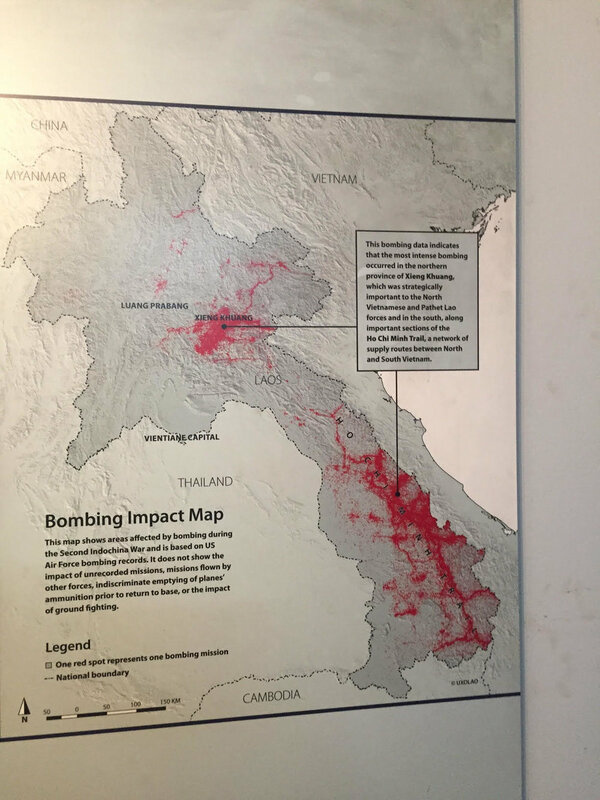 And after visiting the UXO museum in Luang Prabang we were reminded of why it is so important to travel and learn from others. We visited Lunang Prabang because we read that as a UNESCO heritage site, it was a beautiful and relaxed place to stay for a while. For the first 3 days we enjoyed biking, watching (respectfully from a distance) the florescent orange robed monks as they made their way to and from the temples, swimming in waterfalls, going to the night market and eating way too many French baguettes. But this post is not about that. It’s about the brutal history of Laos and it’s people. We visited the small but very informative UXO museum in LP (pay by donation). For those who are not familiar with the term UXO, it stands for Unexploded Ordnance. It rarely seems to be more than a paragraph in high school history books, but Laos has had an extremely difficult and tragic history. It first was under the protectorate of France, followed by a Japanese occupation during WWII, and then briefly reoccupied by France, continuing into civil war after they left, and finally was almost obliterated during the Vietnam War. The Vietnam War in Vietnam, is a well documented and talked about event and everyone for the most part knows about the atrocities that took place there and the protests that ensued in the U.S. But what you don’t hear much about, even now that it is public information, is the secret bombing campaign the U.S. led on Laos that left it the most heavily bombed country in the world. The majority of the bombings took place along the Ho Chi Minh Trail, which during the war, the communist fighters never admitted its existence. So the U.S. followed suit and denied the existence of it’s bombing campaign, because if the Trail didn’t exist, there was nothing to bomb, right? Therefor, no one knew this was happening. The United States forces flew more than 500,000 top secret bombing operations over Laos leaving over 80 million unexploded bombies and millions of other UXO’s that at it’s current clearance rate, will take at least 100 years to make the land safe again. That’s a long time for people to pay for a war that “never happened”. On average, one person is killed every day by a UXO and many more injured and disfigured. Laos is a very poor country, with a lot of farmland and many of the villagers either die or get injured when working in the fields. It is extremely dangerous for kids to walk to school or play in the yard. On top of that, the land and water are contaminated with chemicals that were dropped too. Luckily there is the UXO Lao program that helps to clear the land from these dangers but if it’s going to take another 100 years to clear them all, then the program is completely underfunded and understaffed. They also educate people and children about the danger of UXOs so they can take precautions to avoid them. In 2016, more than 50 years after the Vietnam War, Obama visited Laos and the US government agreed to pay $90 million USD to help clear the UXOs. To us, this isn’t enough. What was done to Laos should be considered a war crime and if individual leaders aren’t held accountable, then nations should be. $90 million is a drop in the bucket to the $700 billion per year or more that the U.S. spends on military. To leave such long-term devastation on a country that affects generation after generation of people who don’t even know what the Vietnam War was, is unacceptable. After leaving the museum we were yet again, left with a bad taste in our mouth for our home country. As the “leader of the free world” and “spokesperson for human rights”, America really has it’s own poor track record on these issues and rarely will America properly own up to its mistakes. Don’t get me wrong; Laos itself has plenty to blame for when it comes to its current status as one of the poorest countries in the world. Because hand in hand with that title, it is also ranked as one of the most corrupt governments in the world, and that is their battle to fight. But how can a country progress when its kids have to fear being blown up on the way to school, or if a farmer has to wonder if he will make it home from the rice patties because of the UXO’s that he knows are still buried out there? And these are issues we are responsible for. We know it won’t happen but we’d like to see the U.S. do more. There are a lot of problems in the world that the U.S. sees fit to interfere in at a huge cost, but this one seems to be of little importance. After all, it was a war we lost and a region we since decided to ignore so why should we pay right?